New Edition’s first big song, “Candy Girl,” released in 1983, was a sweetheart of a hit designed to evoke Jackson 5. The song plays multiple times in part one of BET’s biopic mini-series, The New Edition Story, and every time it plays, it’s a reminder of innocence. (If you’re younger, it might also be a reminder of the movie Love & Basketball, where many millennials first discovered it.) In a particularly solid scene last night, New Edition’s sugar-voiced frontman Ralph Tresvant, played preciously by Jahi Winston, is seen recording the song’s first verse in a studio as the other adolescent members look on in anticipation, wishing for a piece of success. “Candy Girl” was a No. 46 pop chart hit but a No. 1 R&B hit and that’s the beginning of the story of New Edition, a group that was as monumental as a kid in the ’80s imagined them to be. It’s customary now to be concerned about the telling of these types of stories. A good biopic explains a phenomenon in a way that rings familiar to the people who experienced it firsthand while also educating the uninitiated, and not many biopics lately have succeeded in doing so. In particular, Lifetime has singlehandedly soiled the genre, airing amateur Aaliyah, Whitney Houston and Toni Braxton biopics that fall short of meatiness (the next one up is Britney Spears). But The New Edition Story impressed me in its execution the way Vh1's CrazySexyCool: The TLC Story did—by merging accurate biography with nostalgia and tension, and exceeding the low standards of television biopics. The first third of the series does a good job capturing the antsy beginnings of successful childhood performers, focusing on the group’s tender ambitions as grade school kids from the Roxbury housing projects in Boston who ended up making great music together and selling millions of records and were congruently screwed over by the music business, an unfortunate trend among young musicians. By most accounts, the movie is a true story, curated by the New Edition members themselves, who served as producers. 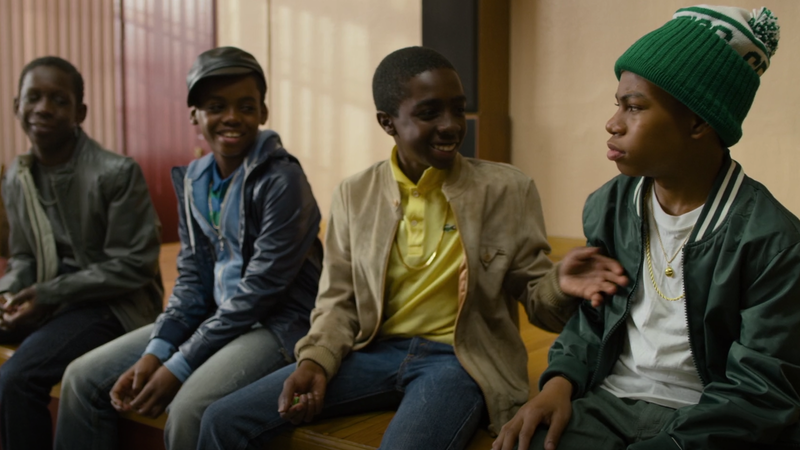 Part I opens with Ricky Bell (Caleb McLaughlin, best known for Stranger Things) begging his mom to attend a talent show, where he and his friend Michael Bivins (Dante Hoagland) meet Bobby Brown (Tyler Williams). Later, there’s an adorable schoolyard scene where Ricky and Ralph compete for a girl’s attention by singing Earth, Wind & Fire’s “Reasons” (the oldies soundtrack in the series is incredibly endearing). When the two friends see a local group called the Untouchables performing at a talent show, they stare in wonderment and desire to mimic the synchronized outfits and moves for themselves. The young actors impressively match the intensity and discipline required of kids trying to be the next Jackson 5 (I normally dislike kid actors but I love these kid actors), which includes hunting down their own manager, Brook Payne, played by a Jheri curled Wood Harris, who I didn’t realize I missed so much. Brook becomes the boys’ mentor and brands them as New Edition (“It’s to let everybody know what the next big thing coming out of Boston is,” he says) and puts them through rigorous performance training (“That’s your money slide,” he says, while teaching dance moves). It’s in these adult figures (Michael Rapaport appears as the band’s next manager, Gary Evans) that themes of manipulation—despite whatever good intentions—play out, even more as the end of the first episode transitions into the group’s bad boy phase. While we see their moms support their musical pursuits, everyone is altogether naive about the financial aspects of the business. As much as we hear about the infighting between girl groups, it happens with the boys, too, and envy and greed plagues the entertainment world. Later on in the series, as in real life, these boys will end up in debt. There’s hesitation anytime a beloved act’s life story is attempted on screen, and the ones with dirt involved are especially dicy, which means not every negative aspect of New Edition’s personal lives and careers will be expelled in the next two renditions. Chris Robinson, who directed one of my favorite movies ATL, still largely nails the execution here with a series that feeds the soul of kids who loved a bunch of scrappy boys.